When life gives you peppers, you make Peperonata. 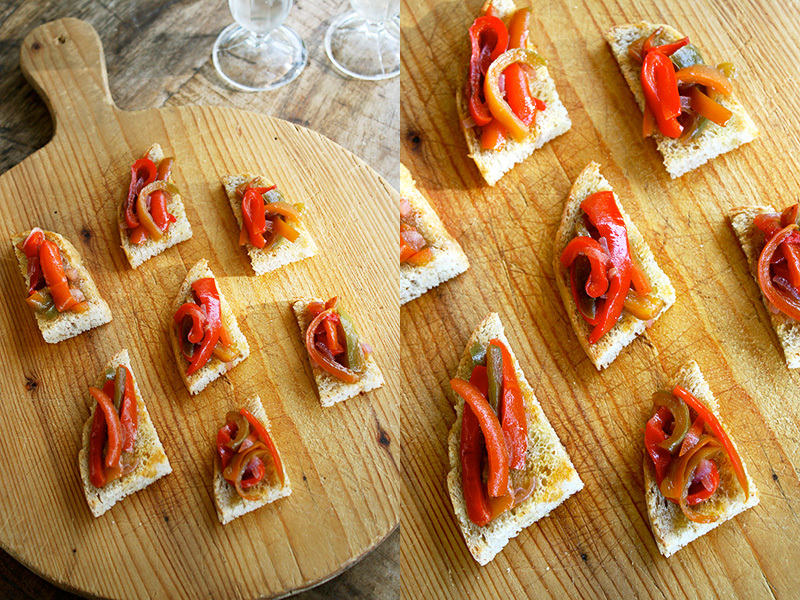 Then you make Peperonata Crostini to accompany a pre-dinner glass of wine to tease the taste buds and get the party started. That’s exactly what I did this summer in Italy. We invited last minute guests to dinner and I needed bite size appetizers to serve with the aperitivi. When my friend walked into the kitchen with an armful of sun-ripened peppers freshly picked from her garden, I just had to turn them into one of my favorite summer dishes. Peperonata gets its name from the main ingredient in this dish: peppers. And more precisely, bell peppers called peperoni in Italian. 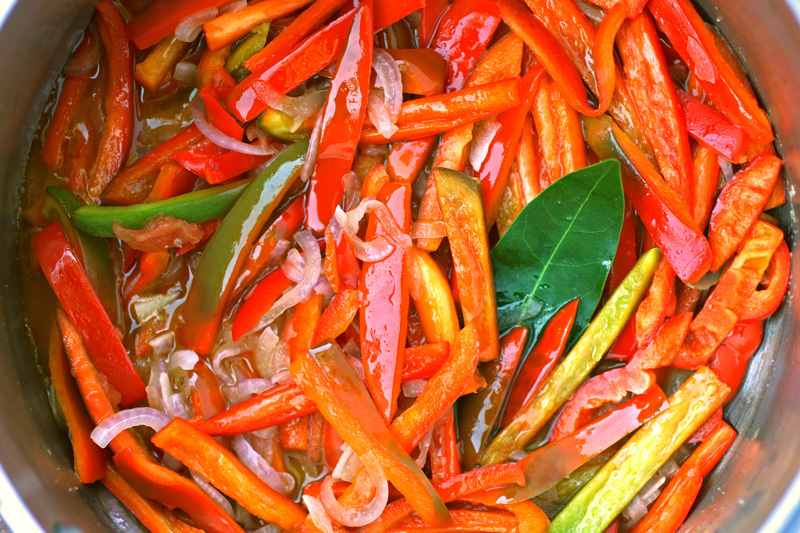 But unlike other preparations that grill, roast or sauté these peppers to play up their sharp, often bitter flavor, peperonata takes a different approach to bring out another side of this capsicum—the sweet side. The result is a magical marriage of flavors that is pure culinary alchemy. In peperonata, lithe ribbons of bright red bell peppers are gently stewed with thinly sliced onions, garlic, and a tinge of tomato until tender, silky and coated with a sweet, syrupy glaze. Fragrant bay leaves lend an aromatic note and a strategic splash of wine vinegar—added as almost an afterthought—gives the stew a surprising tangy finish that lingers on the palate and begs for more. Peperonata’s vibrant mélange of colorful ingredients provides eye candy for an exhilerating taste trifecta of sweet-sour-savory that seduces even the most reluctant pepper eater. While classic peperonata is made with red bell peppers, I often mix it up by using a combination of red, yellow and orange to create a joyful presentation you can taste first with your eyes. This time, the home-grown peppers from my friend’s garden were a stunning shade of cardinal red and naturally variegated with orange and green streaks from various degrees of sun-kissed ripeness. I paired them with red Tropea onions from Calabria for more sweetness. Peperonata is one of those Italian dishes that every home cook should have in their culinary repertoire. It’s simple to prepare, takes relatively little time and is extremely versatile. Traditionally served warm as an Italian contorno, this vegetable side dish pairs exquisitely with roasted meats like pork, chicken or lamb. It can also be served at room temperature as a relish to accompany Italian salumi and cheeses for an antipasto. And in summer months, I love to serve peperonata as a colorful, tasty topping on toasted bread crostini for an irresistible hors d’oeuvre. I learned to make peperonata from my friend Carlo in Sirmione, Italy decades ago. Carlo was a man of few words but spared none in teaching me his secrets to making the perfect peperonata. First, he showed me how to gently cook thin slices of onion until translucent before tossing in peppers—meticulously cut into same size ribbons—to infuse more natural sweetness. Next, after adding “just enough” water muddled with some tomato paste “for color”, he tucked two perfumed bay leaves into the pan. “Stew it at a low simmer with the lid slightly askew…but only until the peppers are supple and barely tender when poked with the point of a knife. Don’t overcook or they will become limp and mushy.” Perhaps his best advice, though, was to add vinegar at the very end then boil uncovered to burn off the brash flavor and reduce it to a sweet, shiny glaze that “makes the peppers look like candy”. These little secrets make all the difference in the world and I’ve been preparing peperonata Carlo’s way every since. Once the peperonata is made, all I do when guests arrive is toast bread slices in the oven and lovingly drape the peppers on top of each crostino. Here I used a country style Tuscan loaf we had on hand cut into quarter moon shapes. But I often use a dense crumb baguette cut into thin rounds that are easy to pick up and eat while balancing a wine glass in the other hand. Then I sit back, enjoy my own party, and savor the sweet taste of summer in every bite of peperonata crostini. Peperonata is a delectable Italian side dish featuring colorful ribbons of red bell peppers stewed with onion, garlic, and hint of tomato in a sweet and savory melange of flavors. Traditionally served warm to accompany roasted meats, my recipe transforms peperonata into a festive, tasty topping on toasted bread crostini for an irresistible appetizer to offer with aperitivi. © Copyright 2016 Deborah Dal Fovo. All rights reserved. 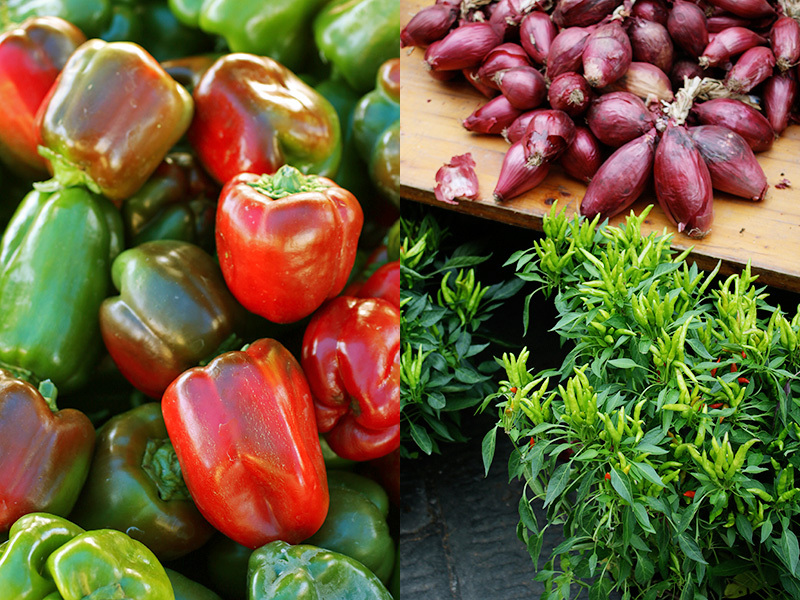 Wash, core and seed peppers then cut the flesh into 1/4-inch thick ribbons, eliminating any white pith. Heat the olive oil and butter In a saucepan over medium heat. Once butter melts, add the onions and garlic then sprinkle with a pinch of salt. Cook gently, stirring occasionally, until soft and translucent, reducing heat if needed to prevent browning. Add the peppers and sprinkle with 1 teaspoon salt, pepper and sugar. 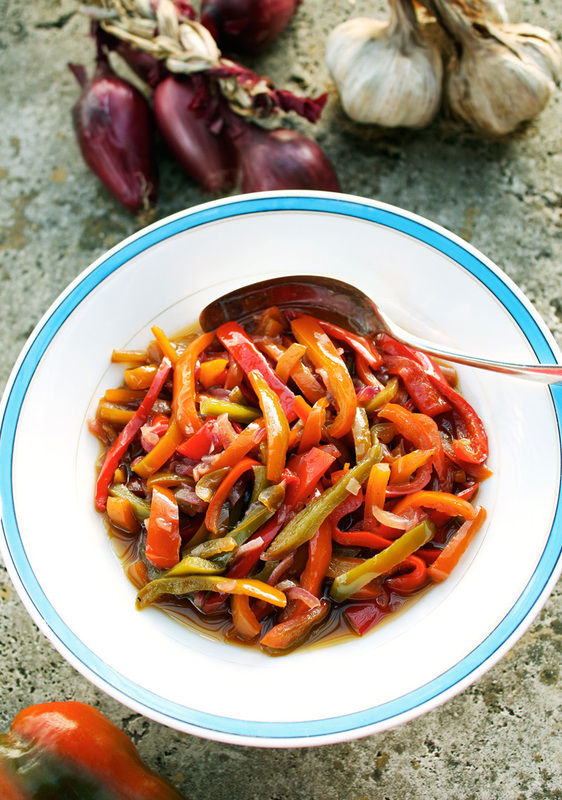 Toss peppers in the cooking oils to coat then cook for a minute or two, stirring frequently. Pour the water and tomato paste mixture into pan then tuck in the bay leaves. Bring to a boil then reduce heat to low and cover pan with a lid slightly askew to allow thin stream of vapor to escape. Cook at a gentle simmer for 25 to 30 minutes until peppers are supple and tender when pierced with point of a paring knife. Add the vinegar and stir to incorporate. Increase heat to medium and boil uncovered for 3 to 5 minutes, stirring, until harsh vinegar vapors evaporate and sauce thickens to a shiny glaze that coats the peppers. Remove from heat and discard bay leaves. Taste for seasoning and adjust if needed. Let the peperonata rest for at least 15 minutes before serving. Can be served warm or at room temperature and refrigerated for up to 3 days. To make the crostini, preheat oven to 350°F/180°C. Cut the bread into 1/4 inch thick slices about 2 inches long. Arrange the bread in a single layer on a baking sheet and brush with olive oil. Place in oven and toast bread until crisp on surface yet soft in center, 5 to 7 minutes. Drape a few ribbons of peperonata neatly on top of each crostino then drizzle with syrupy cooking juices and a thin stream of olive oil if desired. No sooner did I set foot in Italy last summer than the entertaining began. We just arrived in Tuscany and there was already a huge bash happening that night at the villa to celebrate Gianni’s niece’s 18th birthday. A gran gala complete with all the trimmings of an A-list affair had been in the planning stages for months…only for the junior jet-set. My daughter was going with all the cousins and an international guest list of youngsters flown in from London, Paris and beyond. Formal attire was de rigueur for the event — black tie for the boys and long gowns for the girls — and festivities would include champagne (perfectly legal for 18-year olds in Italy), white-glove dinner service, dancing under the stars…the whole shebang. Sounded like fun. But we, the “adults”, were not invited. Only the young and beautiful would attend — a kind of changing of the guard. “That’s ok,” my friend Maria Pia sniffed, “we’ll have our own party for all the parents at our house”. 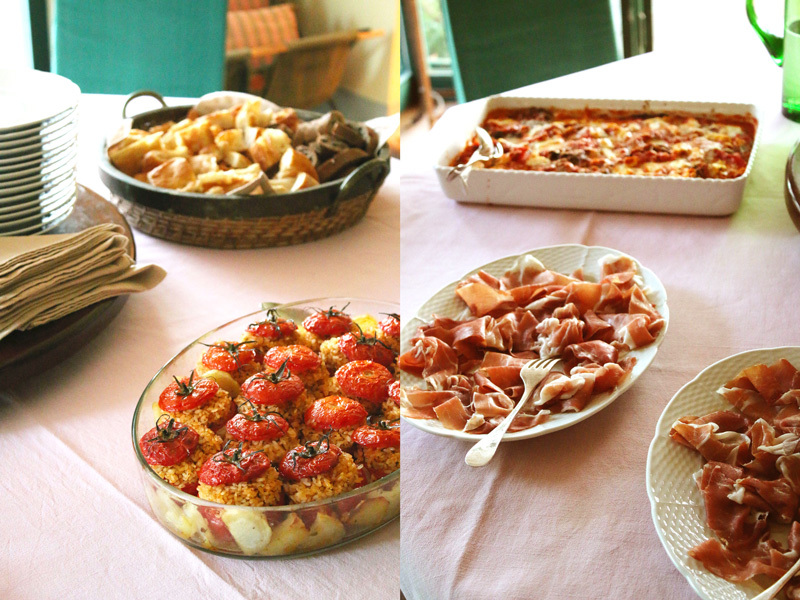 My usual question of “what should I make?” was answered with “qualcosa per un buffet” or something for a buffet dinner. At that exact moment, Maria Pia’s beautiful daughter strutted into the kitchen and announced with aplomb, “I’m wearing a red dress to the party.” Hmmm, I had something rosso on my mind but it was not a dress. There was no question what I would prepare for our dinner party that night and it was also red. Summer was in full swing with record heat waves so tomatoes were ultra-ripe and abundant. 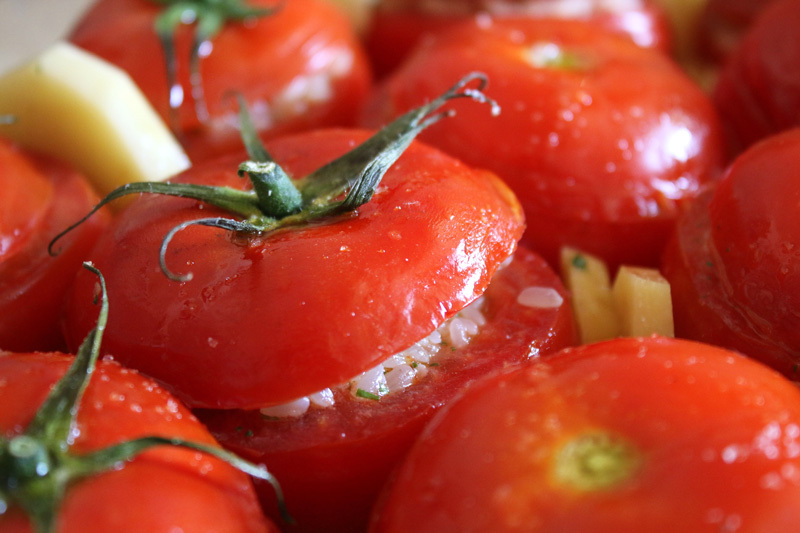 And, when you say tomato to me, I immediately think of…Pomodori al Riso. Pomodori al Riso is a traditional dish from Rome that pays homage to height-of-summer tomatoes like only Romans can — by placing them center stage as divas of baked vegetables that seduce both the eye and the appetite. Voluptuous tomatoes — kissed first by the sun and then by the oven — are transformed into hollow vessels stuffed with fragrant, garlic-and-herb-infused rice that playfully peeks out from under wrinkly red “caps” perched atop their plump curves like festive hats. In addition to a stunning presentation and easy to serve portions, these intensely flavored stuffed tomatoes are prepared in advance and served at room temperature — making them perfect for summer entertaining. 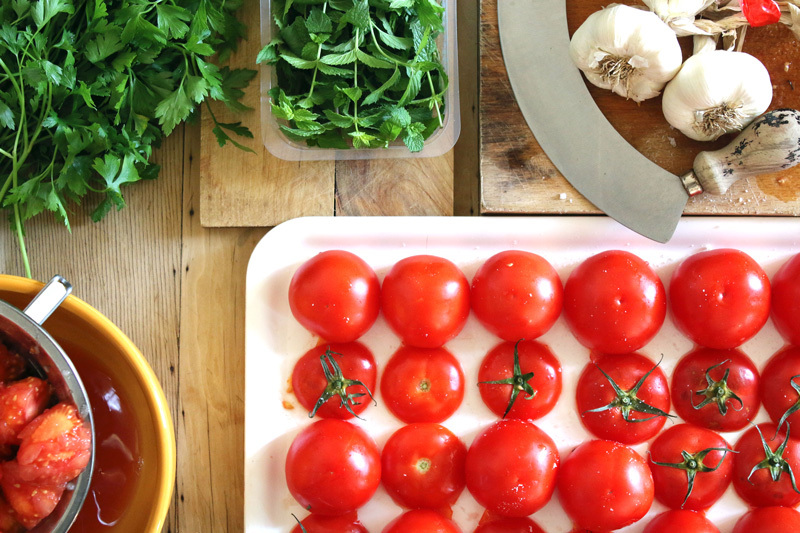 As with all Italian cooking, making good stuffed tomatoes requires good ingredients: ripe yet FIRM tomatoes, excellent quality rice, fruity extra virgin olive oil, fresh mint, parsley and garlic plus…a little manual dexterity and a lot of patience (I’ll explain later). At the local vegetable stand, I chose tomatoes more-or-less the same size (slightly larger than a tennis ball) by gently squeezing each one to make sure it was firm enough to remain intact during baking. These were pomodori ramati, or cluster tomatoes, that are bright red, round and meaty with a herbaceous, vine-ripened scent. In fact, the ones I selected still had stems attached, some of which I’d leave on for presentation purposes. Back in the kitchen, I sliced the rounded tops off the tomatoes to create “lids” then carefully scooped out the pulp, seeds and precious juices from inside each one to form hollow shells with thick walls. This required the use of a serrated grapefruit spoon and a bit of care to avoid piercing the delicate tomato flesh and outer skin (remember the patience I talked about). The hollow tomatoes were turned, cut side down, to drain while the stuffing was made. I pureed the tomato pulp and juices through a food mill to eliminate bitter seeds and tough core then poured in plenty of extra virgin olive oil (I talked about amazing Tuscan olive oil in this previous post). 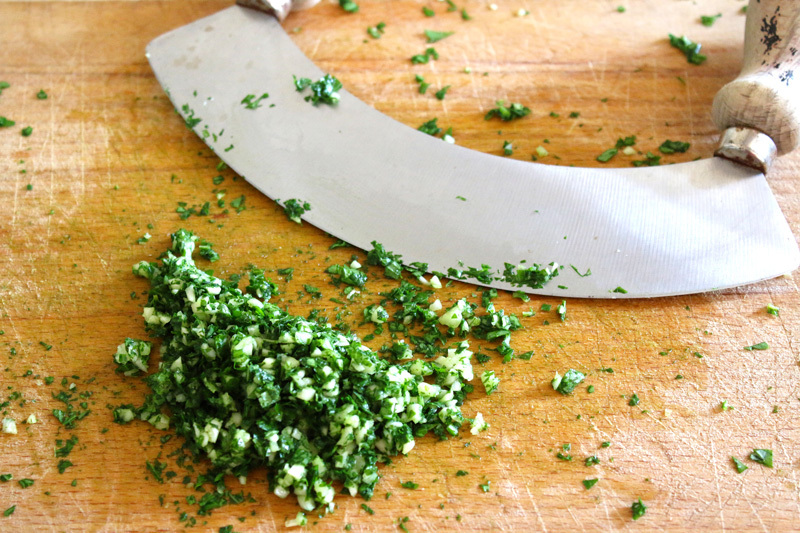 Next, using the resident mezzaluna — a half-moon shaped knife in every Italian kitchen — I made a battuto, or fine chop of garlic-mint-parsley. The rocking motion of the curved blade over this particular combination of herbs released a familiar aromatic scent that reminded me of another classic Roman dish I often make — Carciofi alla Romana — and gives the stuffed tomatoes that unmistakably Roman taste. Rice plays a starring role in this dish and the quality is important. While Arborio works well and is commonly used, Carnaroli or Vialone Nano (also risotto rice) are even better because of their superior quality. I added the raw rice and minced herbs to the tomato juice and gave the mixture a good stir before letting it rest for about half an hour. While the rice soaked up moisture and flavor, I peeled and thickly sliced some potatoes. With all the prep work done, it was time to put this dish together. I arranged the tomato shells upright in an oiled baking dish and filled them almost full with rice and juices before placing their lids back on. Then I strategically wedged potato slices in between the tomatoes to hold them snugly in place as they baked. The rice would absorb the liquid, plump and cook while the tomatoes baked being held upright by the potatoes that cooked at the same time. At that point I stopped to marvel at the brilliance of the Romans and their clever culinary creativity. But that wasn’t the only thing I was admiring. The sight of the assembled dish was so gorgeous that I grabbed my camera to capture the beauty of nature at work. As a final gesture of love, I drizzled the tomatoes and potatoes with more olive oil and sprinkled with salt (tomatoes are very needy) before sliding them into the hot oven. The kitchen soon filled with an irresistible aroma, letting me know that the stuffed tomatoes were almost done. When I took them out of the oven after an hour, they were deeply bronzed with wrinkly skin and the potatoes soft with golden edges. I tasted the rice for doneness and it was tender, moist and very tasty. Now came the hard part, but it had nothing to do with work. Tradition dictates that pomodori al riso rest at least one hour before serving to allow flavors to mingle and marry. The temptation was very strong to sneak a tomato, but I resisted. Maria Pia had already set the table and plated the other items for the buffet. There was nothing left to do but wait for guests to arrive and admire our beautiful daughters in their long gowns as they headed off to the gala. As we, “the adults”, sat around the large round table under the stars, music from the party at the villa drifted over through the trees and became the background sound to our animated dinner conversation. 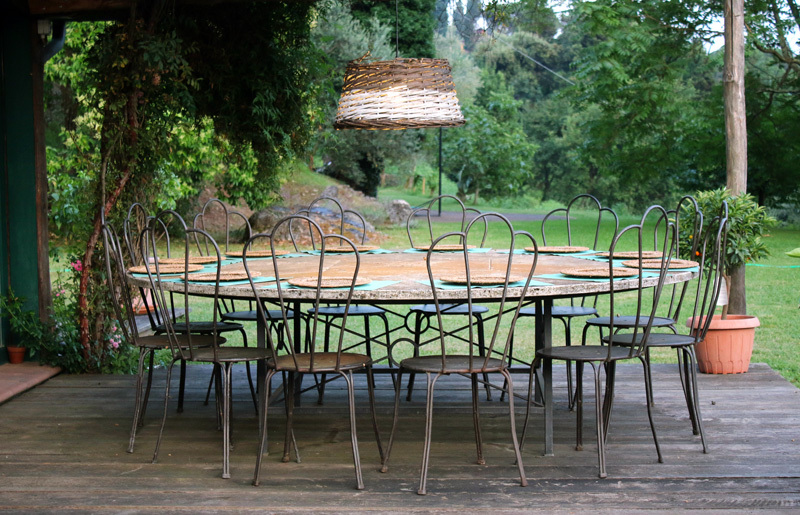 It was effortless, elegant Italian entertaining at its best. And tonight, Maria Pia’s daughter wasn’t the only lady in red. 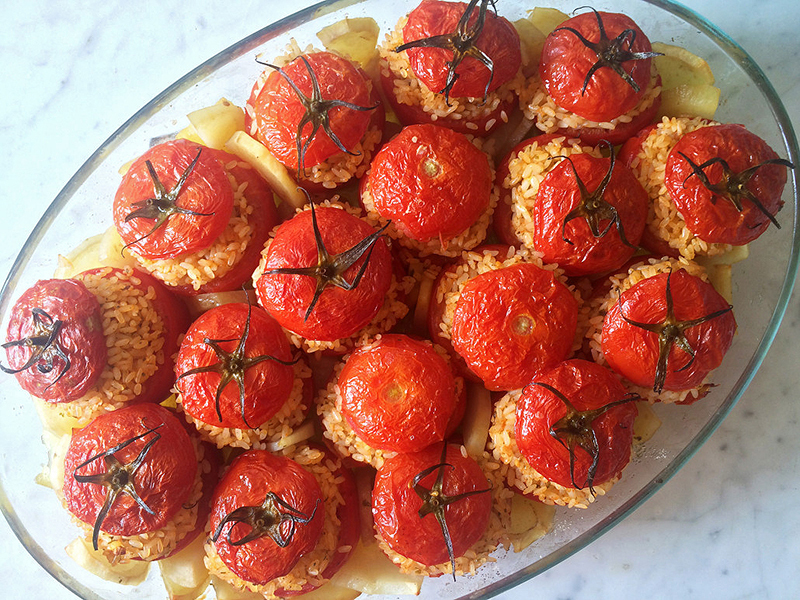 My baked rice stuffed tomatoes made a spectacular entrance on the table and were enjoyed by all. So, when you say tomato, I will always say “pomodori al riso”. 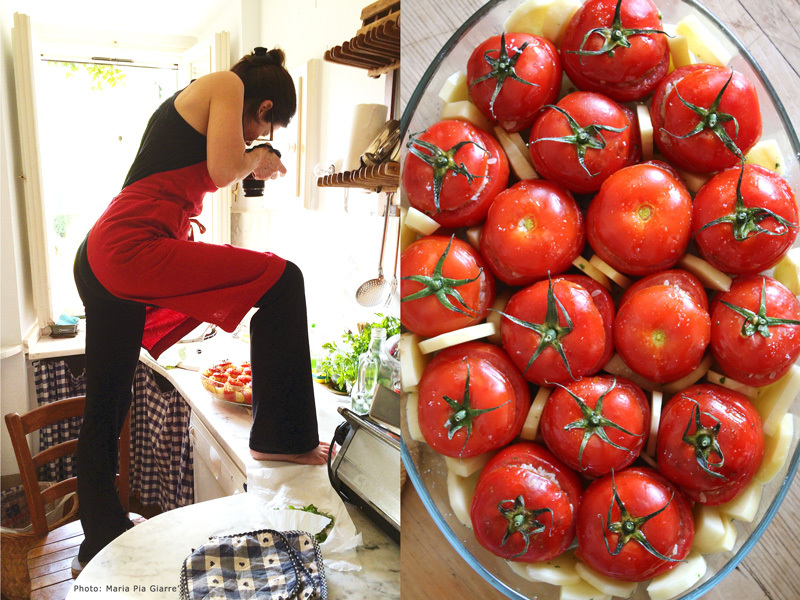 Pomodori al Riso is a beloved Roman dish that is perfect for summer entertaining and as beautiful as it is delicious. 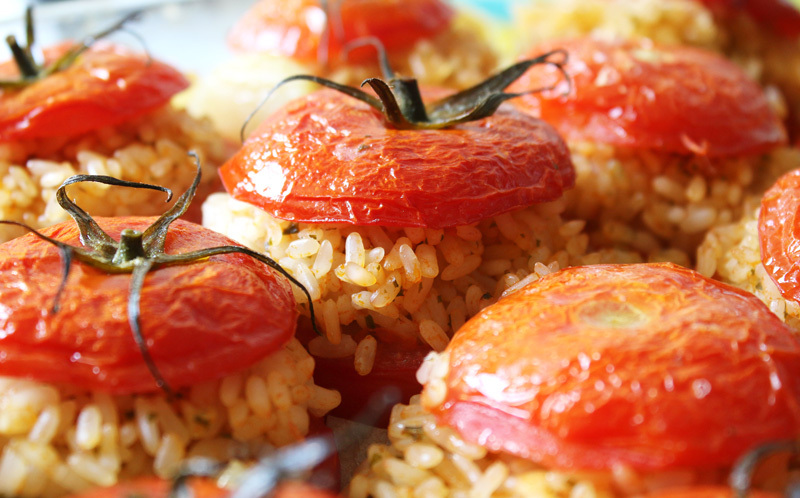 Vivid red vine-ripened tomatoes are hollowed out and filled with rice marinated in the tomato’s own juices, olive oil, garlic and herbs then baked until golden, tender and intensely flavorful. © 2016 Deborah Dal Fovo. All rights reserved. Grease a 9 x 12 oven-proof baking dish with olive oil. Wash and dry the tomatoes. Using a sharp knife, cut a horizontal slice about 3/8-inch off the stem top of each tomato to form a lid, leaving one side attached like a hinge if desired. Working on one tomato at a time, use a serrated grapefruit spoon or small paring knife to cut around the inside perimeter of the tomato between the wall of flesh and inner pulp. Carefully scoop out the pulp, core, seeds and juice directly into a food mill set over a non-metallic bowl. Scrape out the tomato to create a hollow shell with thick wall of flesh on sides and bottom (about 3/8-inch), taking care not to pierce the flesh or skin while you work. Repeat the process with each tomato. Sprinkle a bit of salt inside each tomato then turn them upside down on a cutting board to drain while you prepare the rice stuffing. Puree the tomato pulp and juices through the food mill into bowl, discarding seeds and cores. If you don’t have a food mill, press the contents through a strainer with the back of a spoon into bowl or pulse contents in a food processor to liquify then strain to eliminate seeds and cores. 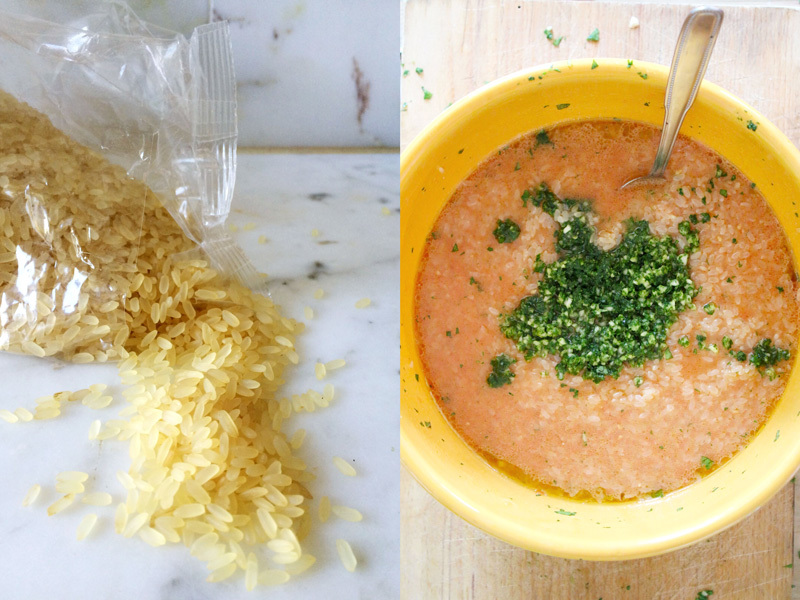 Add the raw rice, extra virgin olive oil, and minced garlic and herbs to the tomato juices. Season with 1-tablespoon salt and freshly ground pepper then stir to combine and let stand for 30 to 40 minutes. Pat each tomato shell dry, inside and out, with paper towels. Arrange the tomatoes, cut side up, in the oiled baking dish. Fill the tomato shells about 7/8 full with rice stuffing then spoon remaining tomato juices evenly each. Place the lids back on the tomatoes, matching up if separated. Peel the potatoes and cut into thick slices. Wedge the potatoes in between and around the tomatoes to hold snugly in place. Drizzle the tomatoes and potatoes liberally with olive oil and sprinkle generously with salt. Cover the baking dish with a sheet of foil and bake in the center of hot oven for 30 minutes. Remove the foil and bake, uncovered, for another 25 to 30 minutes, basting the tomatoes and rice with cooking juices every now and then. The stuffed tomatoes are done when they are deeply bronzed with wrinkled lids, the rice is tender and moist, potatoes are soft inside yet crispy around the edges, and the cooking juices have thickened to a glaze-like consistency. Remove from oven and let rest for at least 1 to 2 hours before serving warm or at room temperature as a appetizer, side dish or lunch entree.